CRAZY DISCOUNT! Was: $299.95 Now: $179.96! If you are on the lookout for an ultra-firm mattress, look no further than the Giselle Bedding Tight Top Mattress. 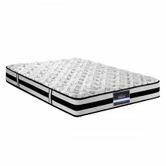 This tight top mattress features a comfort layer with high density foam and innovative pocket spring system for maximum support. Inside, extra thick coils provide firm tensile strength for a natural body alignment that will especially benefit a back-sleeper. Covered in a plush Belgium knitted fabric that is soft on skin and highly effective in absorbing and dissipating body moisture, this tight top mattress guarantees ultra-firm better sleep all the time. Designed to Rest on Any Surface - Floor, Slatted Base and Base Foundation.